I’m sure we can all recall at least one turning point in our lives, where if we had made a different decision our lives probably would be quite different. If you could go back in time and make a different choice, would you want to do so? Here is the story of my crucial decision. It happened during my Freshman year in college. Since the age of thirteen I knew I was attracted to men sexually, but back then (I was a Freshman in 1954) I was unwilling to admit, even to myself, that I was gay. I did not come out as gay until I was in my forties. One day late in my Freshman year a classmate I knew, I’ll call him David, called me up and invited me to his rooms for supper. We were not supposed to cook in our rooms, but apparently he did. David was handsome and I liked him. He was also quite effeminate, and either I suspected or someone told me that he was homosexual. Nonetheless, I accepted his invitation, but at the last minute I got cold feet and asked him if I could bring a friend. He said yes. I dragged my friend Jeff along with me. David was visibly disappointed. He had a spacious private room. 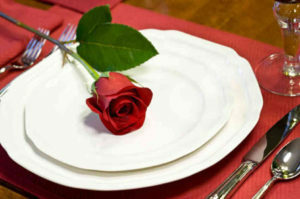 He had prepared a very romantic meal, with wine, candles, two steaks, and salad. David split the two steaks into three portions. Jeff and I ate quickly, embarrassed, and left. I have often wondered what would have happened if I had kept that dinner date alone. Would David have been able to break through my wall of fear? I really liked him a lot. Or would it have been traumatic for both of us. Would I have fallen in love with David (it would have been easy to do). If so, I might have come out to myself and others as gay. Would I then have gone to graduate school? I’ve often suspected that I channelled my energies into my academic life because I was denying my emotional life. If I had come out as gay, even if I had continued my academic career I probably would have ended up near New York, as in fact I did. Had I been openly gay I would have been gay in New York in the 70s when AIDS was rampant but unrecognized. Would I still be alive? Do I wish I had gone on that date alone? I don’t know. This entry was posted in Rudd's Blog, Uncategorized and tagged crucial decision, Harvard, turning point. Bookmark the permalink.